This full page will be available soon. Indigo color. Low impact dyed from fiber reactive dyes approved by GOTS and environmentally safe and non-toxic. Natural color without bleaching. Manual stamping using water based inks. 100% organic cotton tape. Natural color without bleaching. Renewable energy in manufacturing. Chains, sliders and pullers: Zinc alloy (quality, durability, recyclability). It minimizes emissions and needs far less energy than comparable manufacturing processes. Any residue from the process is recycled. 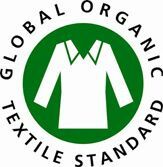 OEKO-TEX Standard 100 Clase 1 Certification.